Are Adaptive Processes Chaotic? | Welcome to the Real World! Home › Adaptive Case Management › Are Adaptive Processes Chaotic? We can sit down together and bemoan or complain in blogs as to why flow-based processes are so often designed wrongly. Most seem to blame the designer taking a wrong approach or not applying some methodology the right way. Others see a lack of customer focus (i.e. Outside-In). From a modeling perspective, the concept of flowcharts is simply too limited. They might resemble how our brain remembers sequential events, but that does not mean that this actually represents the way things have happened or might happen in the future. Whenever humans are involved, you can count on creative chaos appearing. Therefore, I propose that process design is too restrictive to organize human business interactions, while social E2.0 tools provide no business structure. Simply adding the two together still leaves a huge gaping hole in between. The universe and all its evolved structures are complex adaptive systems (CAS) that do not follow simple causal relationships or sequences. We are and always will be ignorant to the total possible complexity. The idea that we can identify and control those relationships is the ultimate fallacy and truly the ultimate arrogance of human reason. In a biological and psychological perspective, our human capability to reason is enabled by our neocortex, but we must never forget that our reasoning is built on totally abstract term definitions that have only a very weak pattern link to reality. We cannot even define what the real components of any CAS are. We cannot identify by statistical analysis of the past how such systems will function in the future, because the observation uses a modeling assumption, an erroneous measurement principle, and completely illusionary causal relationships. We discover this to be true from quantum physics to financial markets. And still we go on and on and on with pronouncing and believing in predictability. The simplification of patterns into terminology explains our human propensity for simple solutions, but the fallacy is in believing that therefore the systems ARE simple. Natural systems are ALL complex adaptive no matter how well some models may seem to apply between arbitrarily chosen cutoff points of system properties. No scientific model has EVER been found to be all-enompassing. Therefore the title of the book ‘Mastering the Unpredictable’ is a catchy title that captures the intent well, but it was neither my choice nor does the book explain how unpredictability can be ‘mastered’. It is however an important milestone in breaking through the Chinese Wall of BPM. Accepting and preparing for unpredictability would be a much better fitting title. ‘Mastering the Unpredictable’ is literally taken an oxymoron, as is ‘controlled anarchy or chaos’. So we could have a discussion on the literal meaning of those terms ‘mastering’ and ‘unpredictable’ and that would be no more than proving my point. Without well-defined terms there is no meaning and no context. Therefore any information system that does not enable to freely define the ONTOLOGY of terms to be used in modeling the real world and allows to continuously adapt them to needs, will simply run into substantial limitations like those experienced with the BPM flow model assumption! 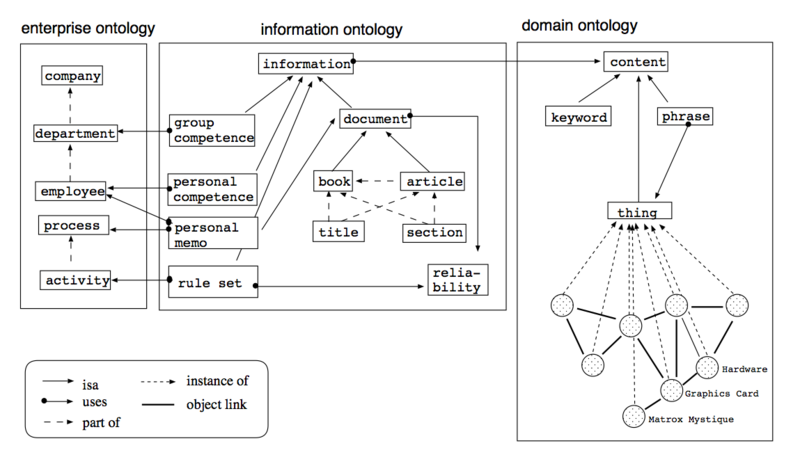 Ontologies and taxonomies are often misunderstood and even mixed up. They seem to be similar but perform two very distinct but related functions. Ontologies declare the terminology of a model language and are created in a design approach. Taxonomies are created by analysis of patterns and describe categorization or generalization-specialization relationships. A taxonomy defines which group something belongs to and how these groups relate, while an ontology defines how to describe knowledge about things. A repository archive uses a taxonomy to categorize the stored instances, while a meta-data repository defines ontologies of application models. Adaptive requires a meta-data repository. In forum discussions and during the ACM tweetjam the suggestion came up multiple times that Adaptive Case Management has to do with controlled anarchy and chaos. I disagree with anarchy as it describes a state of lawlessness in a group of individual agents. That might be correct for SOCIAL, but ACM must include authorization. Empowerment is not decisionmaking for everyone about everything. Chaos in systems relates to a sensitivity to initial conditions and that seems to be applicable for many processes, which makes them impossible to analyze and model them with BPM means. Adaptive processes, despite lacking a predictable and repeatable progression, go nevertheless from a less ordered to a more ordered state through (knowledgable) user action. Order means here a well defined pattern of entity relationships and states, which are the prerequisite for rules to be applicable and those describing the desired outcome or goal. 1) Are unpredictable business processes an aberration that ought to be resolved by a more thorough process analysis? Those who promote BPM, do clearly say that all business activities must be formed into a hierarchy of process flows to achieve a higher state of manageability. All the dynamics and unpredictability are considered to be caused by lack of analysis, unidentified waste, necessary variations and unavoidable exceptions. That is however an assumption and the key fallacy of BPM. EVERY real-world process is in principle unpredictable until it is REDUCED and ENFORCED to be predictable. You might say that this is the point of BPM, so why do I bemoan it? If it is a manufacturing process that has to match many work pieces you better make sure that it is. All other processes that involve human interactions do not fall into those requirements. Some are outright impossible to define this way, such as claims handling, social benefits, processing, court cases, medical treatment, purchse-to-pay clearing, business strategy planning, and even budgeting. Those processes are continuously changing and evolving because of new entities, artifacts, rules and participants. Many of these processes also require actor knowledge that is simply not encodable! So maybe they shouldn’t be process controlled? These actors do need all the relevant information to use their knowledge and their co-actors ought to have access to the same information, as far as allowable by their authorization. So it can’t be social chit-chat, but must be a well controlled environment that supports business data and content. Adaptive, knowledge-based processes link data and content into the right context and consolidate analysis, planning and execution into a homogeneous structure. Therefore adaptive processes have one more key distinction to BPM: they create, collect and preserve NEW knowledge and user experience. That includes the creation of new models, rules and patterns and that is only possible with the use of a user-enabled metadata repository. 2) Can existing BPM systems fulfill the needs of adaptive processes if they are enhanced with social networking, semantic search, ad-hoc processes and content? Also an adaptive process system needs an enterprise, information and domain ontology to function, but in difference it maps all its defined terms in an executable model and allows to classify real-world data patterns to match its definitions. The domain ontology would be the term definition for content classification. To make this accessible for the business user he must be able to formulate business rules for ontology terms and map them to data and content. That could include a user-defined ‘Folksonomy’ mapping. The enterprise ontology further provides the authorization hierarchy mapped to business and process goals. This way empowerment in terms of goals, authority, and means can be achieved by means of technology! 3) What is the difference between a BPM flowchart and an adaptive knowledge work template? The core difference is: WHERE and HOW can a business user formulate the ACTIONS that he wants to take on data or content to reach a GOAL? He must be able to do that at runtime or use that definition to add it to a template for future execution. For a BPM appraoch that is heresy, because how could a user be allowed to change a process or worse, actually create one? But if the process fulfills the management defined goals and is totally transparent in execution and expense, where is the problem? The other criticism is that a user defined process would not ensure compliance to regulation or business principles. That is also not true, because management or legal can create global business rules that would be triggered by certain events in any process and either limit user actions or simply add a compliance goal to the process/case. In adaptive processes it is further possible to add a management or user RATING that prioritizes preferable task-lists higher. How about enabling a customer rating right at the end of that process? Who would still need CRM data mining to fiddle with irrelevant past data? We are talking real-time here and a customer marking ‘unsatisfactory completion’, simply does not close the process, but leads to an ‘improvement goal’. That is the true power of adaptive processes that is not achievable with rigid BPM analysis. Knowledge-driven processes are not just unpredictable, but can be chaotic and very sensitive to initial conditions, but empowering business users to deal with that is not anarchy. Complex knowledge work is unpredictable as are the majority of processes and using goal orientation allows them to be user-defined and -coordinated. Orthodox BPM, even those with added rules, linked social features, and semantic searches lack the meta-data repository for a definable ontology as a prerequisite for adaptive processes. PS: I am not against process management. I oppose the concept that human business interactions are improved by flowcharting them or that human knowledge can be encoded. So I am all for a new kind of BPM that is adaptive and empowers business people. Max, another excellent post. I keep meaning to comment, but rarely have the time to put something intelligent together. But let me at least make a small note acknowledging how good your posts generally are! I am interested in ACM and dynamic business processes. Your blog is one of best knowledge bases. I’m curios how you describe adaptive knowledge work template and how it looks in reality. Cam you give me some examples? Great one and your blog always be the first referance point. The adaptive case management is empowering the knowledge worker and from the tool perspective its all template driven. They wont provide a common or a single interface for the knowledge worker or business analyst. These vendors provide the integration capabilities but the knowledge worker/business analyst need to go to each and every tool to configure accordingly. This is Chaotic. In reality how can we have a template driven architecture which bring everything togather?. Do you have any material which shows how it tacle this? my solution to this (designed ten years ago) was to create a platform that uses a meta-data repository to create the models for data, content, rules, forms, goals and organisation and link all the necessary applications into it, using SOA or else. The platform can then build any kind of process model that fits the organisation’s strategy and objectives. I am not sure what other practical ways to do this would be there. They all would need as you mention heavy integration work. But as most vendors a projcet or consultancy driven it is veing sold this way and as long businesses don’t uderstand that there are other options they will suceed with that approach. It does however create a very rigid infrastructure that hinders the longterm adaptability. It will be like Siebel that was so heavily customized that people could no longer upgrade to new software versions. Not a good situation in the long run. So the empowered knowledge worker can work on this platform which provied all the necessary interfaces (business process, rules engine, collaboration, what not )to deal with the case. It will be great if you can share the adaptive knowledge work template video that you mention in earlier posts. On the topic of ontology, and having attended both FOIS ’01 and FOIS ’10 (Formal Ontology in Information Systems, http://www.formalontology.org — next even this summer very near you) the buzz with the ontologists is that they are rather “worried” about folksonomies, i.e. that these casual constructions won’t “carry the load” and that folksonomies are not robust. There might be a bit of “guild-defensiveness” here, but insofar as an ontology will provide a good foundation, the ontology itself should be rock solid. When I wear my sales hat and think of the challenge of selling new technology, and given that ontology construction is first of all a major a cost, it is difficult to conceive of the social and economic systems that would make ontology-based software possible. I fear that from the point of view of ontology economics, we are in a sub-optimal equilibrium.